Keep reading to discover the fundamental differences between these two game changing strategies. First, let’s discuss Hybrid IT. Hybrid IT governs the deployment and delivery of applications, digital services and information, bridging the gap between legacy and cloud applications. The goal of Hybrid IT is to create cloud-like delivery models that provide users with the tools they need, when they need them. In other words, Hybrid IT is about achieving the same service capabilities of the cloud for the entire infrastructure, be it a traditional data center housed inside your enterprise, or cloud services. It’s important to understand that Hybrid IT is about delivering your workloads with ease and flexibility end-to-end across the entire enterprise as a whole. 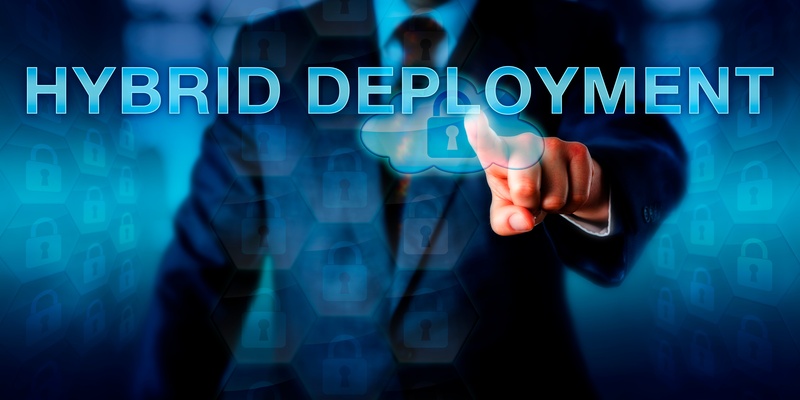 Hybrid IT is about attaining a level of composable infrastructure throughout the data center so that physical, onsite storage and network resources are delivered as services. Offering IT-as-a-Service transforms IT from a supplementary component of your enterprise to a streamlined branch of business centered on self-service, standardization and responsiveness. With a responsive Hybrid IT infrastructure, your enterprise will be able to engage and drive technology decisions quickly and efficiently. The hybrid cloud consists of at least two separate geographical locations where data and applications are stored. Typically, though not always, this cloud deployment architecture involves an onsite private cloud system for the use of just your enterprise that is joined with at least one public cloud. Together they work together to host digital services, data and applications for users, all of which are managed through a common interface overseen by the IT team. [The hybrid cloud] allows [an enterprise] to combine the online capability of a public cloud with the on-premises security of a private cloud. It offers businesses greater flexibility in where they host resources, enabling them to run classified applications or mission-critical workloads on the private cloud, while maintaining the ability to access resources like SaaS and IaaS on the public cloud. With the help of the public cloud, IT is able to increase and decrease the amount of servers they are utilizing to fit the demand of the enterprise while also meeting user needs. This flexibility allows smoother and faster operations while protecting their most critical resources by keeping them on the private cloud. Hybrid cloud offers the best of both worlds. The purpose of both is to reach business goals through the use of cloud technologies. Hybrid IT focuses on how to efficiently manage existing networking systems and multi-cloud solutions, with the goal of delivering IT resources as a service. Hybrid cloud solutions focus on the joint use of public and private cloud storage and computing, offering flexibility while still protecting your most important data. For further reading on Hybrid IT, check out the white paper below, The Challenges of Implementing a Hybrid IT model.